Bo: Bed hair and big girl pajamas. I take a lot of photos. Last year I took thousands of photographs Bo, and only a few of them make the blog-cut. But this year I’m going to try to do something a little different. Once a week, every week I’m going to take a black and white portrait of my daughter. So that we can look back on her journey of this year and see the subtle changes, as they happen, week for week. So that when I am old and grey and she is her beautiful adult self we can look back… because this is where it all begins for her. This is her life. Her beautiful life. 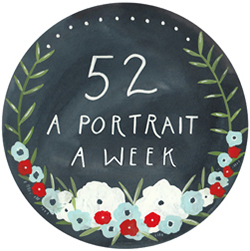 The 52 project is the amazing love child of one of my favourite Aussie bloggers Jodi, from Che and Fidel. At the end of 52 weeks I will have 52 black and white portraits of Bo. Last year has taught me how quickly time passes and how now-moments become distant memories in seconds when you have a child. Time is in fast forward. And I don’t want to miss a thing. anunfounddoor - that scrunched up nose is so sweet. I can’t believe how fast the time goes by when they’re small – the first year with Mister G flew past, so I’m also having a go at the 52 to try and hold a progression… I like the black and white idea too – a thread running through them. I’m thinking to do a year with a particular colour (an exercise I collated retrospectively for 2012 and really liked) but may just settle for a picture where he’s not motion blurred.